MR Home Automation is not your ordinary product or technology company. We are a lifestyle company inspired by ideas that promise more comfort, convenience and fun for people just like you! We take pride in our work, customer service, and in our products. 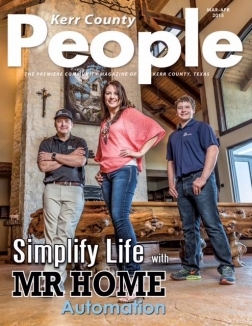 When you choose MR Home Automation you are not only getting top of the line product and installation, but the best in customer service throughout the Texas Hill Country! The start of your project. Building your ideal home, the beginning. MR Home Automation panelized lighting further simplifies lighting control by replacing a bank of light switches with one elegant keypad. With panelized lighting solutions from MR Home Automation all dimming, switching and load management is performed by smart lighting modules tucked away in a panel located in a mechanical room or closet so you can focus entirely on the beauty and not worry about the brains. From anywhere in your home, or anywhere far away you can easily turn on or off your music, lights, heating and air conditioning, and alarm features from an intuitive wall mounted touch-screen panel, a home computer, tablet, or even your smart phone. Your A/C system accidentally left powered, draining energy…. Garage door left open… Security system: unarmed. Back door, unlocked? these are the nightmares that can ruin a dream vacation. Don’t spend your time dreading what might be going wrong at home. Bring your home with you. Whether you would like to simply upgrade your family room with surround sound and a HD television or create your very own movie palace, MR Home Automation can create a home theater system that transcends the cinema experience, making it more personal, more accessible and more fun. 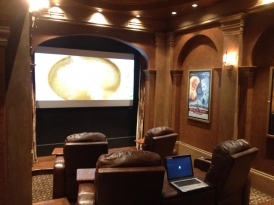 Use our design services to create the ultimate media room, home theater or game room. Imagine having music in every room of your home with just the touch of a button. With our multi-source, multi-zone sound, you can enjoy the music that you love throughout the entire house or just in the room you choose. Whole House Audio lets you relax while listening to your music collection, and enjoy the ease and accessibility of touchpanel and remote control. "Working with Mike and his team has been a very pleasant experience - and that's saying a lot since our two homes are a four-hour drive apart. 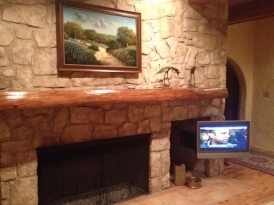 Everyone at MR Home Automation is experienced, trustworthy, and dependable. They took lots of time to not only install our new equipment but to explain, more than once, how to use it. They feel like family to us and are welcome to stop by anytime.Imagine having music in every room of your home with just the touch of a button. With our multi-source, multi-zone sound, you can enjoy the music that you love throughout the entire house or just in the room you choose. Whole House Audio lets you relax while listening to your music collection, and enjoy the ease and accessibility of touchpanel and remote control."